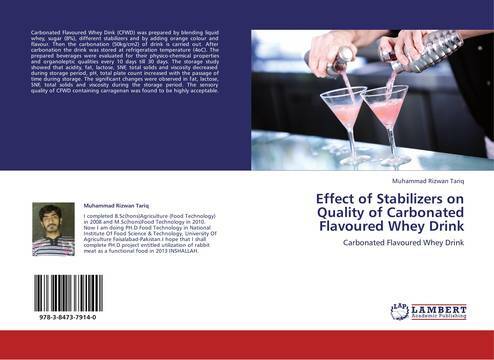 Carbonated Flavoured Whey Dink (CFWD) was prepared by blending liquid whey, sugar (8%), different stabilizers and by adding orange colour and flavour. Then the carbonation (50kg/cm2) of drink is carried out. After carbonation the drink was stored at refrigeration temperature (4oC). The prepared beverages were evaluated for their physico-chemical properties and organoleptic qualities every 10 days till 30 days. The storage study showed that acidity, fat, lactose, SNF, total solids and viscosity decreased during storage period, pH, total plate count increased with the passage of time during storage. The significant changes were observed in fat, lactose, SNF, total solids and viscosity during the storage period. The sensory quality of CFWD containing carragenan was found to be highly acceptable.